After my climb of Kilimanjaro, I made my way back to Arusha. From here I was heading for a rendezvous with Neil and Sara on Zanzibar, an island off the east coast of Tanzania. I took the first morning "express deluxe" bus from Arusha to Dar es Salaam. An African bus station is certainly a site not to be missed. They can't of course be organized in any manner. Basically you know your bus is leaving the station, but so are 50 other buses. They don't depart from a set spot, they kind of idle, lurch and circle around in a decidedly chaotic manner. Street vendors wander from bus to bus, selling food, drink, and super glue to the bus passengers. I found my bus with the help of my taxi driver and another local "guide" (for a tip of course). Neil and Sara wandering the street of Zanzibar city. I eventually, after several attempts, found the hotel Neil, Sara and I were staying in. 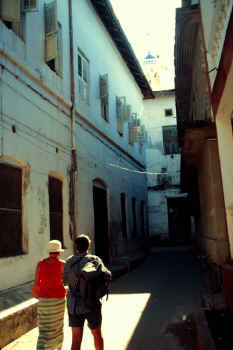 Neil and Sara returned from their tour, they had arrived in Zanzibar just the pervious day. They were delayed in Dar while they tried to get replacement airline tickets for Sara. On the bus from Arusha, they had their day packs in the overhead bins above them. The bus was stopped in Moshi to pick up more passengers, Neil checked the packs, yep still there. Five seconds later, one pack had vanished. The thief didn't get much else except the souvenirs Sara had bought in Vic Falls, they sure must've been pissed to find a wood elephant and not the gold and jewels we mzungus usually carry around. Preparing my mask with the patented spit defogging agent. 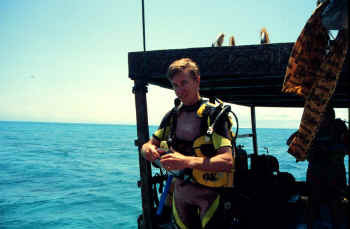 The next day we went on a scuba/snorkeling trip with the Australians. The reef around Zanzibar is quite nice and the visibility was excellent. We did some curio shopping after the dive trip, always bartering the prices down to or 1/3 original price. Neil and Sara eventually closed a package curio deal with a vendor know as Mr. Cheapo, finishing their shopping requirements. I went back to Mr. Cheapo the next day to negotiate my own super duper deal. Neil and the Australian hanging out in the water. We visited the waterfront area for dinner, all the local vendors are out selling fried squid tentacles, calamarie, sugar cane juice and other interesting dishes. We met a young Tanzanian kid who followed us around all evening. As far as we could tell, he had no ulterior motive, he just wanted to practice his English, his dream was to go to America someday. Our next day, we had a taxi take us to the south part of the island. Here you can rent snorkel gear and head out on a boat to swim with the dolphins. Our boat had to stop several times on the way out for spot repairs to be made to our outboard motor. 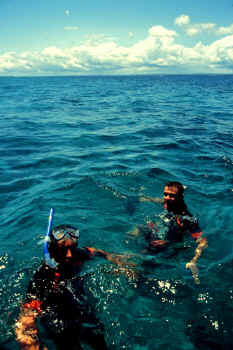 We finally reached an area with dolphins, I jumped out and started the chase. Those dolphins make it look easy, you can be swimming full bore after one while they lazily swim along, toying with you, then they turn on the afterburners and they disappear in the distance. I never got close enough to touch one, but I got within a few yards. 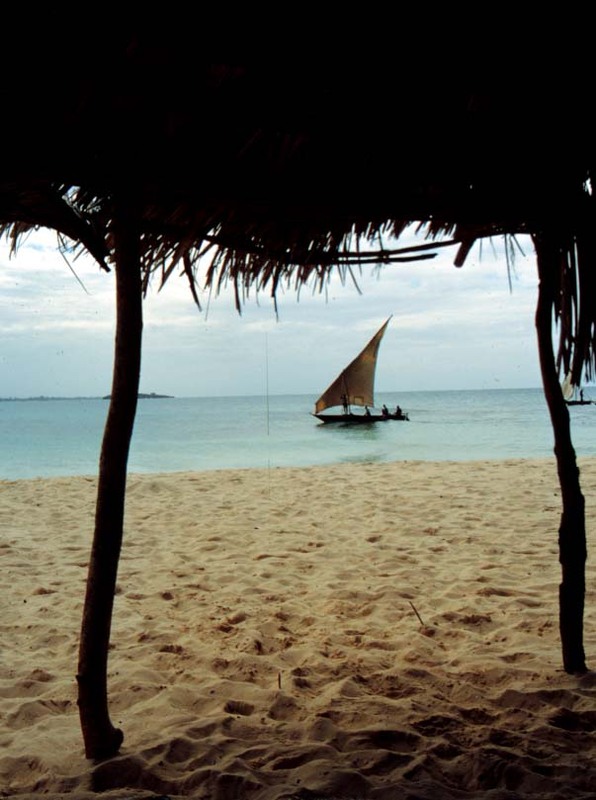 On our last day in Africa we took a dhow over to a beach island. We rented a little grass shelter, complete with hammock. We relaxed all day- dozing, swimming, playing frisbee, and boogie boarding. Neil and Sara flew home the next day, while I had to wait one more day for my flight. On the ride to the airport, I realized I was sick of Africa. The sight of all the people, bikes, cattle, roadside shacks, it just started to annoy me. Culture shock on the last day, pretty convenient timing, makes it easy to leave. I sat at the Dar airport, waiting and waiting for my flight. I was pretty down on Africa when a Tanzanian business man sat down near me. He greeted my in Swahili, I responded with what little Swahili I had learned. He was an interesting guy, working for the agricultural ministry, going to Amsterdam for 3 months of classes. He had a leather handbag, that was his luggage, all of it. He laughed, "You mzungus always carry around so much stuff", pointing at my big checked bag and carry-on. Yeah, I guess we do; spare batteries, sun cream, insect repellent, sterile syringes, clothesline, a hundred other "necessities". What would it be like to head off to a distant land carrying just a small handbag? No space ship of western essentials. Thanks for the inspiration buddy.